Our weekend adventure started as soon as we arrived in Melbourne after a 7-hour overnight Jetstar Starclass flight from Singapore and checked into the classy Crown Metropol hotel. By 10am, we were met by Rebecca, our fun-loving guide from Tourism Victoria who took us on a half-day trip to the Dandenong Ranges. The Dandenong Ranges have been a favorite escape for Melburnians since 1880s when members of Melbourne society would board a train at Flinders Street Station and slowly travel east to enjoy the peace, pure air and pristine forests of these Ranges. Not much has changed except that the Dandenongs are now much more accessible to everyone – just an easy hour drive away from Melbourne city. There is much to do in the Dandenongs beside drinking tea – there are a number of attractions in this area which caters to visitors of all ages and interests. 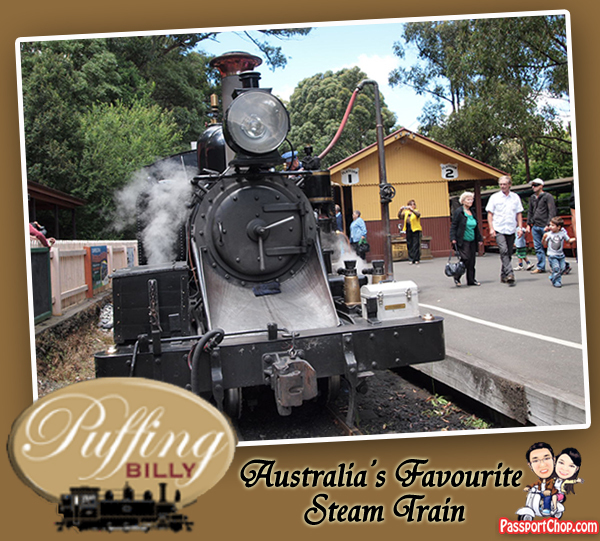 One of which is Australia’s favorite steam train – the Puffing Billy, which runs everyday except Christmas Day! The Puffing Billy is a historic steam train which was built to transport goods and passengers throughout the district in the late 1800s. However due to it being a financial liability on the Victorian Railways and landslide along parts of the track, the decision was made to close the line in 1954. But that’s not the end of the story – thankfully, a mostly volunteer-run Puffing Billy Preservation Society was set up to keep the train running and it has become one of Victoria State’s most visited attraction, carrying over 9 million passengers since it re-opened in 1962. The best part about the Puffing Billy is that it is run mostly by volunteers from the ticket office staff, conductors, station masters and even the engineers who drive the train! We got a quick history of the Puffing Billy along the ride, thanks to our guide/conductor who stayed in the cabin, sharing interesting information about this Puffing Billy route through the Dandenong Ranges. The usual tourist route is to board the train at Belgrave at 10.30am and take the hour-long journey through the picturesque Dandenong Ranges to the Lakeside station where you can either get off for a lunch picnic by a huge lake (that’s why the station is called Lakeside) and reboard the train back to Belgrave at 2.25pm. Note that Puffing Billy train timetables are subjected to change. Refer to Puffing Billy site for the latest timetable. There are different cabins available in the Puffing Billy steam train but you will be surprised that while there are the “1st class” saloon cars which offers more comfortable seats, most visitors will flock to the passenger cars with its wider window sills/carriage windows. By the way, the fare for a Puffing Billy ride depends on the section of your ride not your seats and you are free to swap seats at any of the station (subject to availability). Upon departure from Belgrave, don’t panic when you see most of your fellow passengers climbing onto the carriage windows and dangling/hanging their legs like what you see in the picture below. 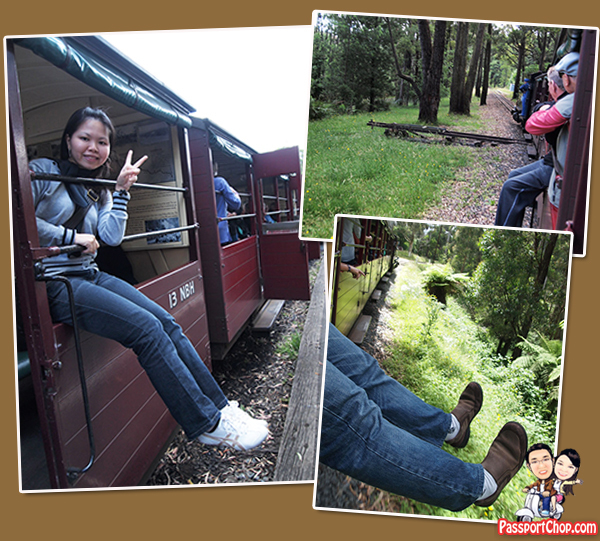 Apparently, it is a tradition to hang your legs out the carriage windows when riding the Puffing Billy but no one knows why – anyway it is fun to do it (not something you can do during your daily commute to work/school – oh well, who even rides a Choo! Choo! steam train nowadays! ); just hang on tight and ensure your shoe is a tight fit (you won’t want to walk back barefooted :-)). A single adult trip ticket from Belgrave to Lakeside (1-hour) and a return cost $26 and $42 respectively and a child fare is about half price. There are discounted family fares where you can buy 2 adult return tickets to Lakeside or Gembrook and take up to 4 children for a total of ONE DOLLAR EXTRA! (perfect for a weekend family outing). Check Puffing Billy website for the latest fares. Besides carrying tourists along the Dandenong Ranges, the Puffing Billy also offers a range of exciting activities e.g. the Steam and Cuisine luncheon train where you can enjoy a 3-course meal along the ride (Adult fares: AUD$95) or the Dinner Special evening train. If your kids or even yourself are fans of Thomas & Friends, check out the special tie-up between Puffing Billy and Thomas & Friends every autumn in Feb/Mar where you can get to meet Thomas and the Fat Controller pantomime! Check out http://www.puffingbilly.com.au for the latest activties/events and how to get to Belgrave station for your adventure onboard Puffing Billy steam train. 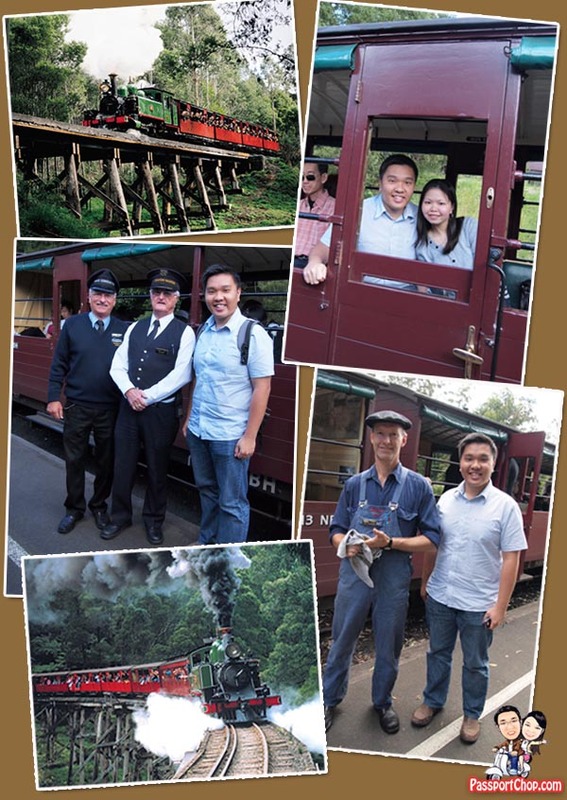 Yes, Puffing Billy Tour is very enjoyable.